Hair loss is not uncommon in women. The causes of hair loss in women are different. Mentioned below are some of the causes of hair loss that can help you understand the situation. Any traumatic event or stress can cause s significant loss of hair, even if it is temporary. This condition is called Telogen Effluvium. If in case you experience a sudden shock, hair loss can occur and become noticeable only after one to two months after the shock. Hair loss due to stress is not permanent and can be controlled when stress is controlled. Women who go in for crash dieting can experience hair loss, as it causes the hair follicles to go into a resting state. A lack of sufficient nutrients in your diet can also trigger hair loss. Once the nutrient deficiency has been corrected, hair may grow back, but it may take up to a few months. Changes in hormone levels are another contributing cause of hair loss in women. Disorder of the thyroid gland which regulates the hormone levels can lead to hair loss. Hair should grow back once the thyroid disorder has been treated. Over styling of hair, using chemicals, extensions, braiding, ponytails, ironing and other hair styling techniques pull your hair and make it weak, resulting in hair loss. This condition is known as Traction Alopecia. To avoid damage that could be permanent, hairstyles that put less tension on the hair is recommended. It is an autoimmune disease that results in complete smooth and round hairless patch on the scalp. This condition may lead to complete hair loss and can happen very quickly. If you don’t have a history of hair loss but are experiencing Alopecia Areata, please consult a specialist. After giving birth, women experience an unusual amount of hair fall. In about six to twelve weeks they will, however, see the changes and things will go back to normal. The change in hormone levels also sees a fall in the estrogen level which causes the hair follicles to go into a resting phase. This condition is known as Post-Partum Alopecia and lasts only for a short period. 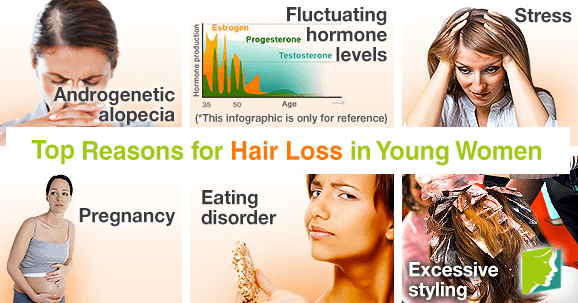 Female Pattern Hair Loss is a hereditary disorder which reduces the hair growing time. It causes the hair follicles to become thinner, smaller, weaker and lighter hair replaces your natural hair. The hair loss usually happens on the top of the head and along the part.